Recreational trails may someday link Red Deer, Innisfail, Lacombe and Sylvan Lake. Red Deer groups have banded together to plan trails through the region. Called the District Regional Trail Steering Committee, the group is hiring a co-ordinator to help develop a strategy and figure out where to put trails. "There will be an extensive public consultation process," said Greg Scott, City of Red Deer community development and planning co-ordinator. Some landowners worry that trails will increase problems like vandalism and noise. Scott said meetings with residents will be held, and commitments from local governments and organizations will be sought. The committee will work with the Alberta TrailNet Society, which has already talked to some landowners. Alberta TrailNet was looking at turning an old CP Rail line from Red Deer to Sylvan Lake into a trail. The new committee will work with Alberta TrailNet, a provincial body, and its Canadian counterpart, the Trans Canada Trail Foundation, which is raising money for a trail across the nation. The committee will include representatives from the city and a least six groups including the Red Deer River Naturalists, Citizens Action Group on the Environment and the Red Deer Visitor and Convention Bureau. A $42,000 lotteries grant will pay for a co-ordinator who will have a one-year contract. "It is the steering committee's hope that through the establishment of a Central Alberta trail network, a more active and healthy lifestyle will be encouraged," said a news release from the city. Despite the support of two Central Alberta MLAs and the city of Red Deer, a recreational trail through some Central Alberta areas won't be any easy sale, one local director says. "There are still major obstacles," said Bob Johnstone, a Red Deer director of the Alberta TrailNet organization. He said some landowners adjacent to proposed trails are worried about their privacy and littering along the routes. "Some residents by the railway right-of-way like those near Sylvan Lake are skeptical." Some residents by the C & E Trail even started a petition against a trail going in near them. Johnstone maintains that a trail which is well managed will show respect for adjacent landowners and clean up for Mother Nature's sake. Alberta TrailNet released its 40-page discussion paper of the proposed recreational trail system and is seeking public input. The report considers recommendations of general trail paths; summary of the social, economic and health benefits of trails; public concerns like use, safety, cost and property values; the positives and roadblocks to setting up a recreational trail in Alberta and how Alberta policy and law affects it all. Area residents interested in what the plan entails can attend an open house on Jan. 20 at the Red Deer College board room beginning at 5:30 pm. Johnstone hopes people will express themselves at the open house, but also hear out those with different perspectives. The trail is intended to provide a route for people to hike, cycle, paddle, snowmobile or horseback ride through their areas. Local people will become the managers or wardens of the trail lines' upkeep. It will link up with other trail systems across the nation. In Central Alberta, the proposed trails head north from Drumheller towards Stettler and Alix, moves west through Red Deer, Lacombe and Sylvan Lake and runs parallel with Highway 11 to the mountain parks and Highway 20 going towards Rimbey. A recommended link to the existing Waskasoo Park trails and a link to Sylvan Lake are areas certain to elicit responses. "There is a lot of interest in this," Johnstone said. People are asked to submit their comments and written views by Jan. 31 so it can become part of the process submitted to Alberta Community Development. 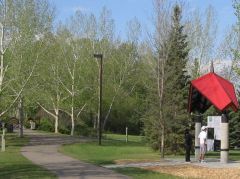 The objective of the Alberta TrailNet is to have all communities linked with each other and major recreation regions by Alberta's 100th birthday in 2005. It is also part of the TransCanada trail system. So far, Red Deer North MLA and provincial Treasurer Stockwell Day and Red Deer South MLA Victor Doerksen have both thrown their support behind the proposal. The public input process involves public meetings in six provincial locations including Red Deer, Cochrane, Lac La Biche, Sherwood Park, Peace River and Medicine Hat. The consultations are being organized by Alberta TrailNet and the Trans Canada Trail Foundation are being facilitated by Alberta Community Development. The opinions, written comments and recommendations being offered by Albertans will be incorporated into a revised proposal and a final document is expected to be submitted to the provincial government later in 1998 to guide the planning of the trail system. The draft proposal is the result of two years of research and consultation by Alberta TrailNet. Do you enjoy jogging along the river between Heritage Ranch and Bower Ponds, or cross-county skiing around the River Bend Golf Course? How would you like to ride a horse from Red Deer to Sylvan Lake, or cycle across the country instead? If Bob Johnstone and Jim Woychuk have their way, such long-distance excursions may not be far away. The two men, along with Grant Johnson, are Red Deer directors with the Alberta TrailNet Society, an organization working to develop a network of trails through the province linking communities, recreational areas and other points of interest. The society is also responsible for the creation of an Alberta link in the TransCanada Trail, which will extend from coast to coast, with a northern leg reaching up from Alberta to Tuktoyuktuk. "They'd like to see it opened by Canada Day 2000," said Johnstone of the proposed 15,000-km Trans Canada Trail. The Alberta TrailNet Society is hoping to complete its own network of trails by 2005, the province's centennial. In the Red Deer area it is focusing on two prospective routes: one following the old CP Rail line from a point south of Red Deer to Sylvan Lake; and another along the C&E Trail from near Springbrook to the Blindman River, incorporating the Red Deer trail system on the way. Woychuk says trail use will be restricted to non-motorized forms of transportation, with the possible exception of snowmobiles. Bob Kochan, a local volunteer with the Alberta TrailNet Society, adds the goal is to locate trails away from traffic routes like highways. Where possible, the Alberta TrailNet Society and the TransCanada Trail Foundation plan to reclaim abandoned rail lines. Johnstone explains these old lines are ideal for trail development since they are already located on land right-of-ways and have a good base. He adds the objective is to involve local groups and organizations in the development and maintenance of the trails. "It's a people-power thing," explains Kochan. "It relies on a volunteer effort." The cost of trail construction will vary significantly, depending on a variety of factors. 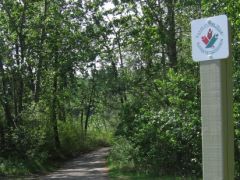 In the case of the Trans Canada Trail, for which its foundation is raising money, it is estimated roughly $36 will be needed for every metre. A trail system around a community like Red Deer would offer a number of benefits, agree the local society members, most notably the promotion of recreational and social opportunities. "The great thing about trails are people of all ages can use them at any time of the day," says Johnstone. "They can use them for five miles or five hours; they can use them alone or they can use them with friends." Woychuk, who as Red Deer's parks facility foreman is responsible for maintenance of the city's existing trail system, also believes rural trails around Red Deer would be used by some as a means of commuting to work. And Kochan says a trail system would help conserve green space and promote a greater awareness and appreciation of nature and wildlife. In this regard, says Johnstone, it may be possible to erect markers along the trails, providing information about nature and identifying historic points of interest. But not everyone is climbing aboard the Alberta TrailNet bandwagon. Johnstone acknowledges some landowners with property near proposed trails are worried about a loss of privacy and the potential for vandalism. Past experience has shown such problems are rare along well-managed trails. Johnstone estimates there are currently 20 to 30 local residents involved in the Alberta TrailNet Society. It's a groundswell of support he and Woychuk hope will continue to grow. "The enthusiasm is certainly building and there's more interest out there," says Woychuk.